My name is Ian, and I'm a Simaholic. It all began innoSimly enough, when a friend (and certifiable Simian) was loading some software onto my computer, and announced, almost as an afterthought, "You'll need a game too. And this is the perfect one." A column of antsiety tickled its way up my spine, saliva dripping and mandibles clicking, preparing to Drive-in to my prefrontal lobes. My last experience with computer games had been back in the days when a mouse was still a rodent. A moronic but endlessly time-wasting diversion called "101 Monochrome Mazes" had brought me within three green cursor strokes of the end of an academic career. And this game was in color. Pseudo-3D. Music and other swell effects. That first click sure packs a kick. Landscapes never seen before spring into existence, and vanish just as readily under the cruel hand of one's own divinity. In the beginning was the map. And the depth of the waters was chosen in just measure, and the earth was raised above them to its alloted height. And forest of due density was sown upon the face of the land. I saw that it was good and clicked on "DONE". I placed roads and painted the land with coloured squares and watched cranes mushroom into view and funky factories and toon-ish towers and higgledy-piggeledy houses. I heard lilting music and gurgles, pops, buzzes and cheers. Demoted from the role of absolute God, I found myself part of a pantheon, with fellow divinities issuing commands which I learned to ignore at my peril, for there is nothing so tragic as watching one's technicolor town turn into a blackened slum. And the town grew and the night progressed and quicker than you can say Braun Llama Dome it was dawn again in the real world and I went outside into the real city where the buildings shimmered in a Simian glow. When I finally slept my dreams were alive with train whistles and hydro fizzings and the detonations of power plants. And when I awoke in the early afternoon I was back at the screen searching for the secrets of seaports, SimSubways and city ordinances. And there came to be evening and there came to be morning, a first day. In the days and nights that followed I became a monk of the Zen of zoning. I pursued the puzzle of police power, the riddle of road taxes, the conundrum of commercial connections, the mystery of military bases. And when there came to be evening and there came to be morning, and it was a seventh day, I did not rest. In the weeks that followed I built hamlets in primeval forest, villages in narrow valleys, towns in treeless desert, island settlements in universal ocean, cities surrounded by soaring mountains, and megalopolises sprawling to the four corners of a flat map. I was awarded the key of the city. My wise and healthy citizens threw spontaneous parades in my honor. I learned the miracle of the multiplying statues. I acquired the arcanum arcanorum of Arcologies. I discovered the final secret of SimEarth. Oh, man! And there came to be evening and there came to be morning, and it was a fiftieth day. I copied my SimCity folder onto a diskette, trashed the original, and mailed the floppy to another city. I thought I was cured. Many months passed before I learned the cruel truth. It happened one fateful day in my local computer store, when my eye happened to fall onto the cover of a SimCity CD. The urge was immediate and uncontrollable. Within minutes the cybersludge of Satan himself was oozing onto my hard drive, and I was once again prisoner of the screen. There is no such thing as an ex-Simaholic. This time things were both better and worse. Worse, because SimCity Urban Renewal Kit is a piece of software expressly devised to waste an infinite amount of time. 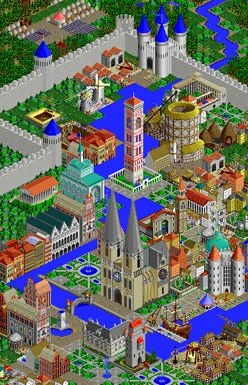 Better, because SCURK has made SimCity much more than a puzzle. O Masters of Maxis, you have created the palette of a new form of art, lush as oils, sumptuous as sculpture, intricate as a Byzantine mosaic. You have given us SimSinners great comfort, for at last we can shed the epithet "game player". You have allowed us to call ourselves artists. Once you are SimSated why not visit my other pages? I am a photographer, film maker, and author and will take you on a tour through some surviving remnants of our primeval planet. Experience the wild beauty of British Columbia and Tibet. Meet the Penan, gentle nomads of the Borneo rainforest. If you want to contact me, you will find my e-mail address posted on my home page.